The formation of a colored charge-transfer (CT) complex between atorvastatin calcium (ATR-Ca) as a n-electron donor and 2, 3-dichloro-5,6-dicyano-1,4-benzoquinone (DDQ) as a π-electron acceptor was investigated, for the first time. The spectral characteristics of the CT complex have been described, and the reaction mechanism has been proved by computational molecular modeling. The reaction was employed in the development of a novel microwell-based spectrophotometric assay for determination of ATR-Ca in its pharmaceutical formulations. The proposed assay was carried out in 96-microwell plates. The absorbance of the colored-CT complex was measured at 460 nm by microwell-plate absorbance reader. The optimum conditions of the reaction and the analytical procedures of the assay were established. Under the optimum conditions, linear relationship with good correlation coefficient (0.9995) was found between the absorbance and the concentration of ATR-Ca in the range of 10-150 μg/well. The limits of detection and quantitation were 5.3 and 15.8 μg/well, respectively. No interference was observed from the additives that are present in the pharmaceutical formulation or from the drugs that are co-formulated with ATR-Ca in its combined formulations. The assay was successfully applied to the analysis of ATR-Ca in its pharmaceutical dosage forms with good accuracy and precision. The assay described herein has great practical value in the routine analysis of ATR-Ca in quality control laboratories, as it has high throughput property, consumes minimum volume of organic solvent thus it offers the reduction in the exposures of the analysts to the toxic effects of organic solvents, and reduction in the analysis cost by 50-fold. Although the proposed assay was validated for ATR-Ca, however, the same methodology could be used for any electron-donating analyte for which a CT reaction can be performed. 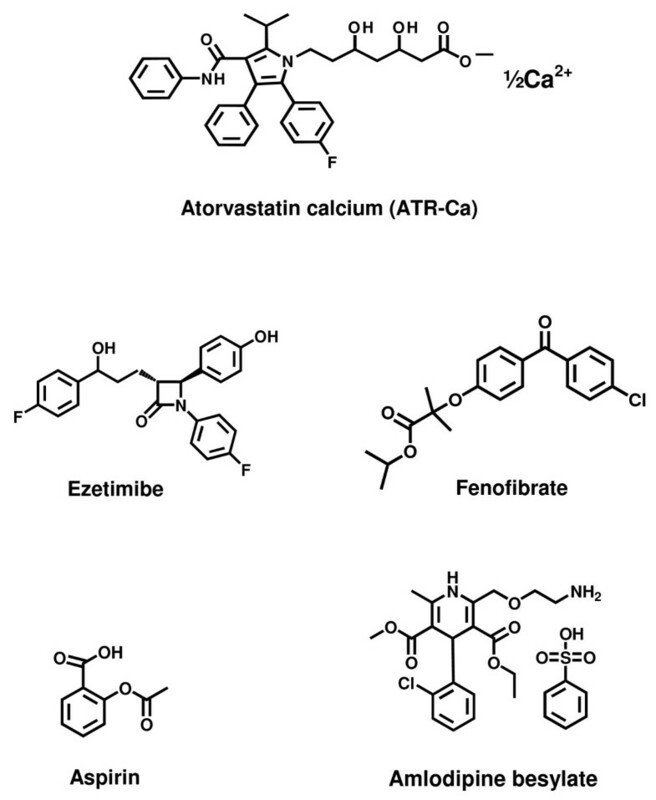 Atorvastatin calcium (ATR-Ca); [(R-(R*, R*)]-2-(4-fluorophenyl)-β, δ, dihydroxy-5-(1-methylethyl)-3-phenyl-4-[(phenyl-amino)-carbonyl]-1H-pyrrole-1-heptanoic acid calcium salt (Figure 1), is a second generation synthetic 3-hydroxy-3-methylglutaryl-coenzyme A (HMG-CoA) reductase inhibitor . It exerts its action by specifically inhibiting the HMG-CoA reductase, the enzyme that catalyzes the conversion of HMG-CoA to mevolanate, which is the early rate-limiting step in the biosynthesis of cholesterol in the body. Inhibition of the enzyme decreases de novo cholesterol synthesis, increasing expression of low-density lipoprotein receptors (LDL receptors) on hepatocytes. This increases the uptake of LDL by the hepatocytes, decreasing the amount of LDL-cholesterol in the blood. ATR-Ca also reduces blood levels of triglycerides and slightly increases levels of HDL-cholesterol. ATR-Ca is the most efficient and frequently prescribed drug for the treatment of hypercholesterolaemia . The chemical structure of atorvastatin calcium (ATR-Ca) and the co-formulated drugs. Atorvastatin calcium is official in USP 34  and it is analyzed in its bulk by HPLC, however the USP does not describe an assay method for ATR-Ca in its dosage forms. This beside the therapeutic importance of ATR-Ca was behind the growing interest in the development of analytical methods for its determination in its pharmaceutical formulations. In general, spectrophotometry is the most widely used technique in pharmaceutical analysis because of its inherent simplicity and wide availability in most quality control laboratories [4–9]. However, the spectrophotometric methods that have been reported for determination of ATR-Ca in its pharmaceutical formulations [10–16] suffer from major drawbacks. These drawbacks include decreased selectivity due to measuring the native light absorption of ATR-Ca in the blue-shifted ultraviolet region, which might be subjected to interferences , employment of multiple-steps of non-selective oxidation reactions [13–15], and tedious liquid-liquid extraction procedures using large volumes of organic solvents in the methods based on formation of ion-pair associates . Therefore, the development of a new alternative spectrophotometric method for determination of ATR-Ca in its pharmaceutical formulations is very essential. The molecular interactions between the electron-donating pharmaceutical compounds and electron-accepting reagents are generally associated with the formation of intensely colored CT complexes, which usually absorb radiations in the visible region. The rapid formation of these complexes leads to their widespread utility in the development of visible spectrophotometric methods for analysis of many pharmaceutical compounds [17–23]. Literature survey revealed that the CT reaction of ATR-Ca has not been investigated yet. As well, in a previous study, Darwish IA  demonstrated that the alkali salts of carboxylic pharmaceutical compounds have excellent electron-donating ability, thus it is anticipated that ATR-Ca (the active ingredient of its dosage forms) will exhibit electron-donating capabilities. These facts promoted our interest in employment of the CT-reaction as a basis for the development of a new spectrophotometric method for determination of ATR-Ca. However, all the conventional CT-based spectrophotometric methods that have been reported so far are not automated and consequently their throughput is low, thus their applications in pharmaceutical quality control laboratories are limited. Moreover, these methods suffer from the consumption of large volumes of organic solvents, which leads to high analysis cost, and more importantly, the incidence of exposure of the analysts to the toxic effects of the organic solvents [24–28]. For these reasons, the present research proposal is devoted to investigate the CT reaction of ATR-Ca, and its employment in the development of novel non-conventional spectrophotometric assay with high analysis throughput and can reduce the consumption of organic solvents in the determination of ATR-Ca in its pharmaceutical formulations. Microwell-plate absorbance reader (ELx 808, Bio-Tek Instruments Inc. Winooski, USA) was used for all the measurements in 96-microwell plates. UV-1601 PC (Shimadzu, Kyoto, Japan) ultraviolet-visible spectrophotometer with matched 1 cm quartz cells was used for recording the absorption spectra. 96-Microwell plates were a product of Corning/Costar Inc. (Cambridge, USA). Finnpipette adjustable 8-channel-pipette was obtained from Sigma Chemical Co. (St. Louis, MO, USA). ATR-Ca and amlodipine besylate were obtained from Pfizer Inc. (New York, USA). Ezetimibe was obtained from AK Scientific Inc. (California, USA). Fenofibrate, and aspirin were obtained from Sigma Chemical Co. (St. Louis, USA). DDQ (Merck, Germany) was 0.1% (w/v) in methanol and it was prepared fresh daily. Lipitor tablets (Parke Davis, Germany) and Lipicure-10 tablets (INTAS Pharmaceuticals, India) labeled to contain 10 mg ATR-Ca were obtained from the local market. An accurately weighed amount (25 mg) of ATR-Ca was dissolved in 10 ml water in a test tube. The solution was transferred into a 100-ml separating funnel, then rendered acidic with 10% HCl. The liberated atorvastatin (acid form) was extracted by chloroform. The chloroformic solution was evaporated under nitrogen, and the obtained residue was reconstituted in methanol. The methanolic solution was tested for its ability to exhibit CT reaction. Into a 5-ml calibrated flask, 10 mg of ATR-Ca was accurately weighed, dissolved in 2 ml methanol, and completed to volume with the same solvent. This stock solution was diluted with methanol to obtain the suitable concentrations that lie in the linear range of the assay. Twenty tablets were weighed and finely powdered. A quantity of the powder equivalent to 20 mg of ATR-Ca was transferred into a 10-ml calibrated flask, dissolved in 4 ml methanol, swirled and sonicated for 5 min, completed to volume with the methanol, shaken well for 15 min, and filtered. The first portion of the filtrate was rejected, and a measured volume of the filtrate was diluted quantitatively with methanol to yield the suitable concentrations that lie in the linear range of the assay. Accurately measured aliquots (100 μl) of the standard or sample solution containing varying amounts of ATR-Ca (10-150 μg) were transferred into wells of 96-microwell assay plates. One hundred microliters of DDQ solution (0.1%, w/v) was added, and the reaction was allowed to proceed at room temperature (25 ± 1°C) for 5 min. The absorbances of the resulting solutions were measured at 460 nm by the microwell-plate reader. Blank wells were treated similarly except 100 μl of methanol was used instead of sample, and the absorbances of the blank wells were subtracted from those of the other wells. The Job's method of continuous variation  was employed. Master equimolar solutions (2 × 10-3 M) of each of ATR-Ca and DDQ were prepared. Series of 200 μl portions of the master solutions of ATR-Ca with DDQ were made up comprising different complementary ratios (0:10, 1:9, ........., 9:1, 10:0, inclusive) in each well of the 96-microwell assay plate. The reaction was allowed to proceed at room temperature (25 ± 1°C) for 5 min. The absorbances of the developed colors were measured at 460 nm by the microwell-plate reader against blank wells treated similarly except methanol was used instead of ATR-Ca sample. The measured absorbances were plotted as a function of ATR-Ca mole fraction. The generated plot was used for determination the molar ration of ATR-Ca:DDQ. The molecular modeling for the CT complex was performed by using CS Chem3D Ultra, version 9 (Cambridge Soft Corporation, Cambridge, MA, USA) implemented with molecular orbital computations software (MOPAC), and molecular dynamics computations software (MM2). The proposed assay was designed to employ 96-microwell assay plate as the CT reaction was carried out in microwells of the assay plate (200-μl reaction volume) instead of the conventional volumetric flasks (10,000-μl volume). The solutions were dispensed by 8-channel pipette, and the absorbances of the colored CT complex were measured by microwell-plate absorbance reader instead of the conventional spectrophotometer. In the present study, ATR-Ca was selected based on its therapeutic importance, clinical success, and the expected electron-donating ability. This selection was supported by a previous study made by Darwish IA , which demonstrated the excellent electron-donating property of alkali salts of carboxylic acid pharmaceutical compounds. Previous studies involving CT reactions with polyhalo-/polycyanoquinone electron n-acceptors revealed that DDQ is one of the most efficient reagents in terms of its reactivity [21, 30]. Furthermore, its CT reaction with electron-donating analytes is instantaneous [21, 22]. For these reasons, DDQ was used as electron acceptor in the development of the proposed assay. The 96-microwell design of the proposed assay was based on the previous success of Darwish et al  in the utility of this design for determination of some other pharmaceuticals. 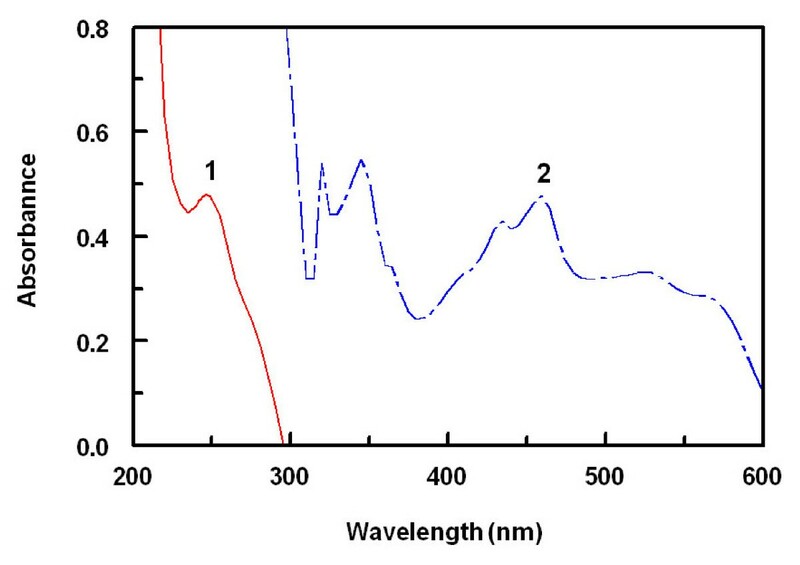 Absorption spectrum of (1) ATR-Ca (125 μg/ml) and (2) reaction product of ATR-Ca (125 μg/ml) with DDQ (0.1%, w/v). Further support of this assignment was provided by the absorption maxima with those of DDQ radical anion produced by the iodide reduction assay . The dissociation of the (D-A) complex was promoted by the high ionizing power of the polar solvent and the resulting peaks in the absorption spectra of drug-acceptor reaction mixtures were similar to the maxima of the radical anions of the acceptors obtained by the iodide reduction assay . The optimization of experimental conditions affecting the reaction in the 96-well format was investigated by altering each reaction variable in a turn while keeping the others constant. In all cases, measurements were carried out at 460 nm, as this maximum gave the highest absorptivities and ultimately the highest analytical sensitivities. The results of variations in the DDQ concentrations indicated that 100 μl of 0.1% (w/v) was the optimum DDQ concentration, as this concentration gave the highest absorbances. Previous studies  demonstrated that the interaction of electron-donors with DDQ in polar solvents (e.g. methanol and acetonitrile) produces CT complexes with molar absorptivity values higher than those produced in non-polar solvents (e.g. chloroform). Different polar solvents were tested as reaction solvent; these solvents were methanol, ethanol, 1-propanol, 1-butanol, and acetonitrile. The obtained absorbances were 0.493, 0.480, 0.464, 0.432, and 0.483, respectively. These values indicated that methanol offered the highest sensitivity, therefore it was selected for the subsequent experiments. As well, these solvents has no any harmful effect on the transparency of the microwells. The optimum reaction time was determined by monitoring the color development in the microwells at room temperature (25 ± 1°C). Complete color development was attained instantaneously, however for higher precision readings, the reaction was allowed to proceed for 5 min. The developed color remained stable at room temperature for at least a further 30 min. Job's method of continuous variation was used for determining the molar ratio of ATR-Ca to DDQ. The obtained Job's plot was given in Figure 3, from which it was concluded that the ATR-Ca:DDQ ratio is 1:2. This indicated that two moles of DDQ interacted with one mole of ATR-Ca. Considering the divalent calcium ion, the reaction was postulated to proceed as 1:1 ratio for DDQ with atorvastatin anion via only one site of interaction in spite of the presence of more than one possible electron-donating sites; OH of the side chain and the nitrogen atom of pyrole ring. The site of interaction was preliminarily postulated to be the anionic carboxylate moiety of ATR-Ca. To prove this suggestion, the CT reaction was carried out using the parent atorvastatin acid. 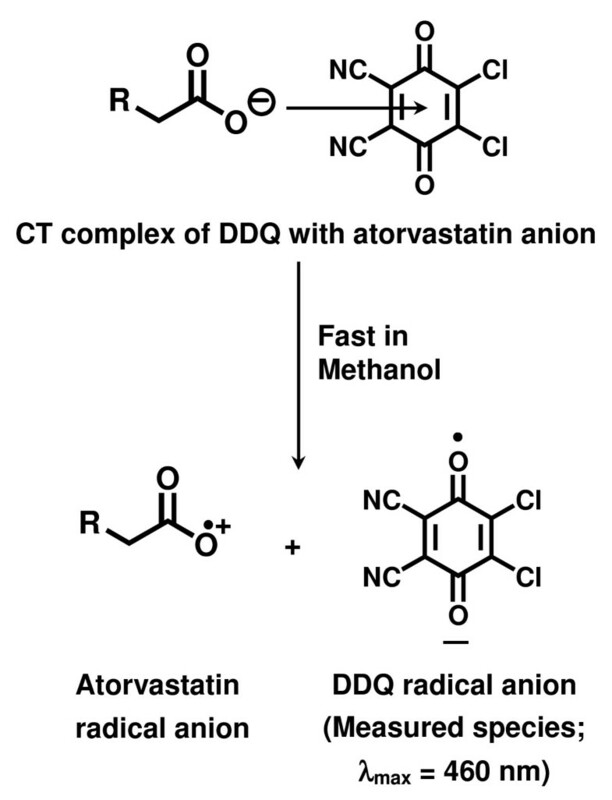 It was found that atorvastatin did not exhibit CT reaction indicating that the anionic carboxylate moiety of ATR-Ca was the site of CT interaction with DDQ. For further support of this assumption, modeling for the CT complex was performed. Atorvastatin anion and DDQ were energy-minimized alone and both together. It was found that the highest electron densities in the atorvastatin molecule are located on the two oxygen atoms of the carboxylate anion followed by the two alcoholic oxygen atoms of the side chain. The total charges on each of the two oxygen atoms of the carboxylate anion were found to be -0.6234 and -0.5975. Therefore, it is expected that the carboxylate anion moiety of ATR-Ca will move toward DDQ to form the CT complex (Figure 4). These facts, taking the molar ratio in account, confirmed that only the carboxylate oxygens are involved in the complex formation, and the reaction proceeded as described in Figure 5. The nitrogen atom of the pyrole ring and OHs of the side chain did not contribute in the CT reaction based on the fact that certain electron density was required for achievement of a successful electron transfer . Job's plot for CT reaction of ATR-Ca with DDQ. 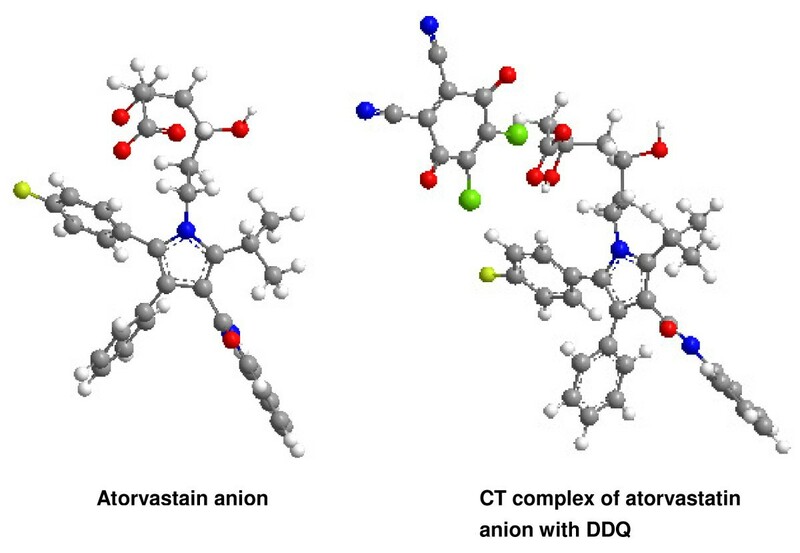 Energy-minimized atorvastatin anion and its CT complex with DDQ. Mechanism of CT reaction of ATR-Ca with DDQ. 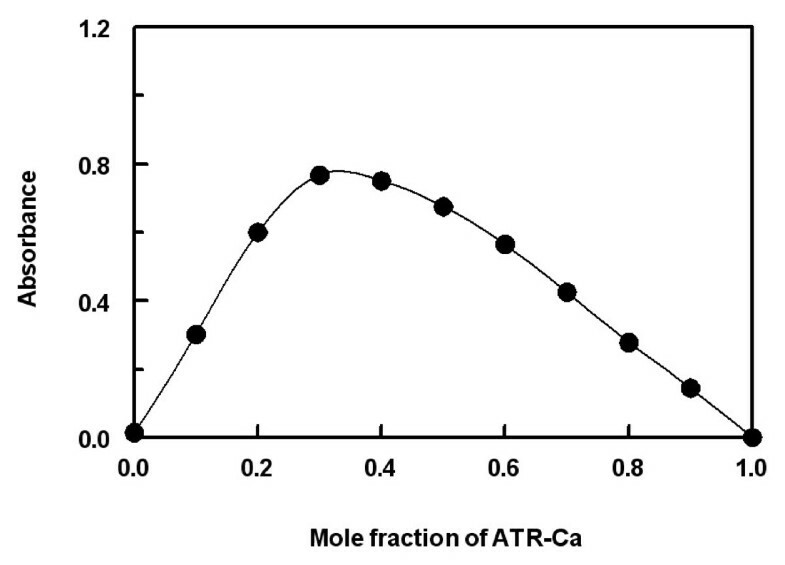 Under the above mentioned optimum reaction conditions, the calibration curve for the analysis of ATR-Ca by the proposed assay was constructed by plotting the absorbances as a function of the corresponding concentrations. The regression equation for the results was derived using the least-squares method. Beer's law plot (n = 5) was linear with very small intercept (0.0045) and good correlation coefficient (0.9995) in the concentration range of 10 - 150 μg/well (100 μl). The limits of detection (LOD) and quantitation (LOQ) were determined  using the formula: LOD or LOQ = κSDa/b, where κ = 3 for LOD and 10 for LOQ, SDa is the standard deviation of the intercept, and b is the slope. The LOD and LOQ values were 5.3 and 15.8 μg/well (100 μl), respectively. The quantitative parameters of the proposed assay are given in Table 1.
a Each well contained 100 μl of ATR-Ca sample. Accuracy of the proposed assay was assessed by analytical recovery studies. Recovery was determined by the standard addition method. Known amounts of ATR-Ca were added to pre-determined drug-containing pharmaceutical formulation, and then determined by the proposed assay. The mean analytical recovery was calculated and found to be 97.03-99.91 ± 0.33-3.49% indicating the accuracy of the proposed assay. The precisions of the proposed assay were determined on samples of drug solutions at three concentration levels for each drug (Table 2) by analyzing 5 replicates of each sample as a batch in a single assay run. The relative standard deviations (RSD) did not exceed 1.48% (Table 2) proving the high precision of the assay for the routine application in quality control laboratories. This high level of precision was attributed to the accuracy of the volumes that have been concomitantly dispensed in the microwells by multi-channel pipettes, and completeness of the reaction the small volume (200 μl). The proposed assay has the advantages that the measurements are performed in the visible region, away from the UV-absorbing interfering substances that might be co-extracted from dosage forms that contain ATR-Ca. The interference from the congenital drugs that is co-formulated with ATR-Ca in some of its dosage forms was studied. These drugs were aspirin , fenofibrate , ezetimibe  and amlodipine besylate [39, 40]; the chemical structures of these drugs are given in Figure 5. Potential interferences of these drugs were studied in a ratio which is normally present in their combined dosage forms. No interferences from these drugs were found with ATR-Ca in the proposed assay. Although, amlodipine has basic character, however it is co-formulated with ATR-Ca as besylate salt that did not show any ability for CT reaction with DDQ under the proposed assay conditions. As well, no interference was observed from the excipients with the proposed assay as indicated from the obtained good recovery (mentioned above). The absence of interference from the excipients, even though they contain basic component(s) was attributed to the extraction of the ATR-Ca tablets prior to the analysis with methanol in which the excipients do not dissolve. The commercially available pharmaceutical formulations of ATR-Ca were subjected to the analysis by the proposed and reported methods  and the obtained results were then statistically compared with each other. The mean percentage recoveries, relative to the labeled amounts, obtained by the proposed assay were 97.24 ± 1.50 and 99.82 ± 1.05% for lipitor and lipicure-10 tablets, respectively (Table 3). In the t- and F-tests, no significant differences were found between the calculated and theoretical values of both the proposed and the reported assays at 95% confidence level. This indicated similar accuracy and precision in the analysis by the proposed and reported methods. a Values are mean of five determinations ± SD. b The tabulated values at 95% confidence limit are 2.78 and 6.39, respectively. - Reduction in the consumption of organic solvents in the CT-based spectrophotometric analysis, accordingly reduction in the exposures of the analysts to the toxic effects of organic solvents. - Reduction in the analysis cost by 50-folds which can be reflected on the price for the finished dosage forms, thus it can reduce the expenses for the medications. - Providing a high throughput analytical methodology that can facilitate the processing of large number of samples in a relatively short time. This property was attributed to the use of multi-channel pipettes for efficient dispensing of the solutions, carrying out the analytical reaction in 96-well plates (as reaction vessels), and measuring the color signals in the 96 wells at ~ 30 seconds by the plate reader. - The advantages of the proposed assay and in addition to automation could be reached by application of Flow Injection Analysis. - Although the proposed assay was developed and validated for ATR-Ca, however, it is also anticipated that the same methodology could be used for essentially any analyte that can exhibit CT reaction. TW participated in the design of the study and conducting the optimization of the assay conditions and validation. NK participated in the assay design and conducted the assay validation and analysis of dosage forms. HA carried out the molecular modeling of the ATR-Ca:DDQ charge-transfer complex. ID designed the study, participated in the results discussion and prepared the manuscript. All authors read and approved the final manuscript.